The Better Shelter is named as overall winner of the 2016 Beazley Designs of the Year awards. The winners of the annual Beazley Designs of the Year awards have been announced at London's Design Museum, with the top prize going to a timely and inventive contribution towards the global issue of population displacement. The Better Shelter, developed by Johan Karlsson, Dennis Kanter, Christian Gustafsson, John van Leer, Tim de Haas, Nicolò Barlera, the IKEA Foundation and UNHCR, is designed to be a safer and more dignified home for people who have been displaced due to conflict and natural disasters. The innovative flat-pack design comes in a two-box kit that's easy to transport and comes with all the necessary tools, and it can be assembled in around four hours. It features a lockable front door and a solar-powered wall that provides enough energy to power the shelter's light or charge a mobile phone. There are already 30,000 Better Shelters in use; the judges were impressed with the project as a clear demonstration of scalable design that has the ability to make a worldwide impact. "Better Shelter tackles one of the defining issues of the moment: providing shelter in an exceptional situation whether caused by violence and disaster," says one of the judges, Dr Jana Scholze from Kingston University. "It shows the power of design to respond to the conditions we are in and transform them. 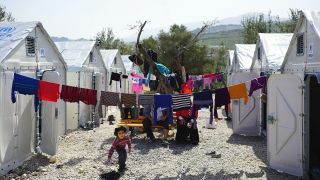 Innovative, humanitarian and implemented, Better Shelter has everything that a Beazley Design of the Year should have." The Better Shelter was chosen as overall winner after being selected as the winner of the Architecture category. Other category winners included Jonathan Barnbrook's iconic design for David Bowie's Blackstar album, Space Cup, a coffee cup for astronauts, and Lumos, a next-generation helmet with integrated lights and signals. The six category winners along with the further 70 other nominations are on display at the Design Museum until 19 February; find out more here.